In early America, respectable folk in Protestant communities have always regarded the fiddle as the devil’s instrument and dancing as downright sinful. 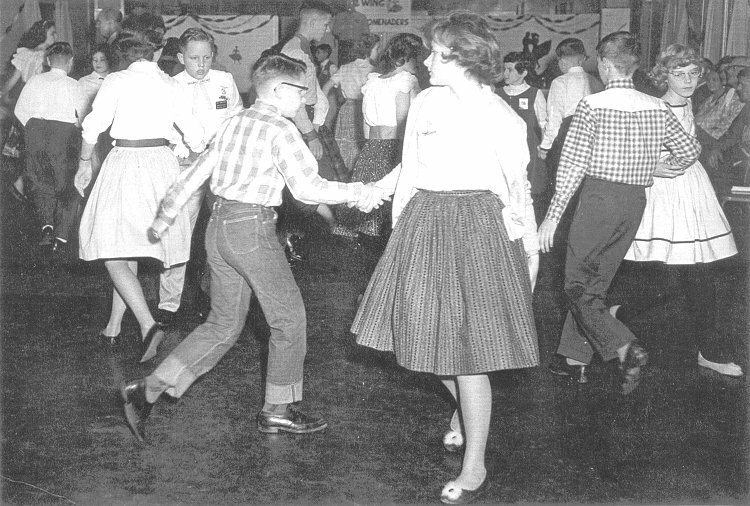 Faced with such a religious prejudice for socializing, young people of the frontier developed the “play-party,” in which all the objectionable features of a square dance were removed or masked so that their grave elders could approve. No instruments were permitted – the dancers sang and clapped their own music. In time, the play-party acquired a life of its own. It became an ideal amusement for teenagers and young married couples. In many a frontier community, the bear hunters, Indian fighters, the rough keel-boat men and the wild cowboys could be seen dancing innocently with their gals, like so many children at a Sunday school picnic. “Skip to My Lou” is a simple game of stealing partners. It begins with any number of couples hand in hand, skipping around in a ring. A lone boy in the center of the moving circle of couple sings, “Lost my partner what’ll I do?” as the girls whirl past him. The young man in the center hesitates while he decides which girl to choose, singing, “I’ll get another one prettier than you.” When he grasps the hand of his chosen one, her partner then takes his place in the center of the ring and the game continues. It’s an ice-breaker, a good dance to get a group acquainted to one another and to get everyone in the mood for swinging around. It’s interesting to note that “loo” is the Scottish word for “love.” The spelling change from “loo” to “lou” probably happened as our Anglo ancestors, and the song, became Americanized. I decided that since I was allowed to play musical instruments, I would use guitar and banjo on this song. Source: The Folk Songs of North America, by Alan Lomax, Doubleday. Recordings on file by: Carter Family, Lead Belly, Mike & Peggy Seeger, Pete Seeger. [D] Skip to my lou, my [G] darlin’.